The Water Department currently serves 6,800 customers through 84 miles of water mains and over 550 fire hydrants. Easton Utilities pumps water from naturally filtered underground aquifers (water-bearing sands) through six wells that are 1,000 to 1,200 feet deep. We then treat the water as required and pump it into the distribution system. The water that comes out of a customer's tap includes water from each of these wells. No single well provides all of a customer's water. Of those wells, four are drilled 1,000 feet into the Magothy Aquifer. The final two wells are drilled 1,200 feet into the Upper Patapsco Aquifer and feed directly into a state-of-the-art water treatment plant on Glebe Road. The storage capacity of Easton's Water Department is 2 million gallons, which is met through two separate 1 million gallon deep water wells. In 2005, Easton Utilities added the second 1-million gallon elevated water storage tank to improve fire flow capability, boost system-wide water pressure, and add capacity sufficient to accommodate the Town's future needs. Completed in 2007, Easton's Enhanced Nutrient Removal Wastewater Treatment Facility is one of Maryland's most environmentally friendly wastewater treatment plants. 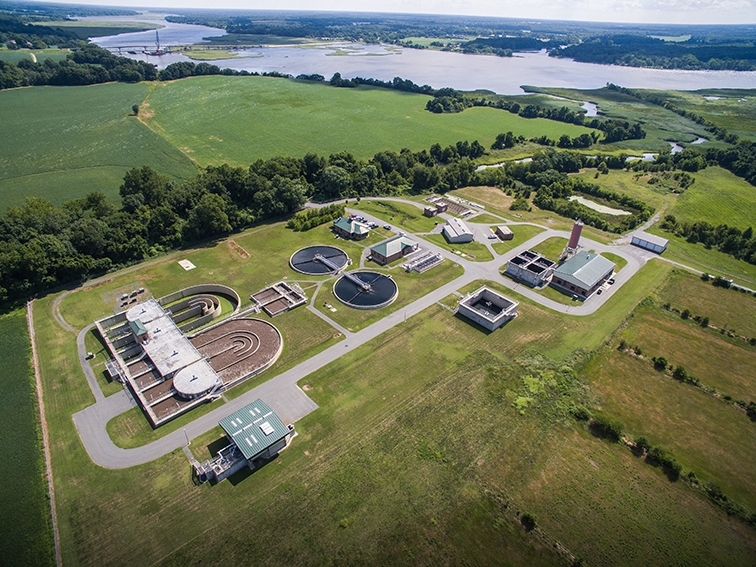 Utilizing Enhanced Nutrient Removal technology, Easton's new facility meets or exceeds the Chesapeake Bay water quality goals by reducing annual concentrations of nitrogen to 3 milligrams per liter (mg/l) and phosphorus to 0.3 mg/l. These equate to 70 percent and 88 percent reductions respectively. While Easton Utilities' former facility had operated effectively, more stringent nutrient limitations and growing demand reached the point that the facility required a significant upgrade. This new facility was the first to receive funding from the State of Maryland's Chesapeake Bay Restoration Fund. The facility employs a wide range of innovative technology including ultraviolet radiation for disinfection and an advanced Solids Handling System to convert sludge into a dry, manageable and useful fertilizer.